Poverty and Economic Development in Asia’s Largest Slum. What is it about slum areas that intrigue people? Is it the constricted spaces that some call home while others call hell? Or the vibrant colors that fill the narrow alleys and shops? Slums have always had a certain aura that surrounds them, which makes people take a second glance. Dharavi, one of Asia’s largest slums, is host to over a million people living in an area of 0.67 square miles. From the outside, Dharavi looks like an ordinary slum area– poor sanitation, lack of basic facilities and miniscule houses pressed against each other. But only a closer look into this magnificent area will show that Dharavi is not an area consisting only of substandard housing or insufficient services, but a well-knit economic community. In an expensive city like Mumbai where real estate prices are skyrocketing, Dharavi provides the cheap alternative that many people seek. Most people come to the city from nearby villages in search of opportunity. With rent prices in Dharavi going as low as 4 dollars a month, a majority of the city’s poor seize the opportunity and add to the already large community residing in these homes. 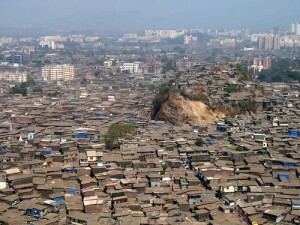 One can easily see the level of income inequalities present in Mumbai when viewing the area around Dharavi. Tall buildings surrounded by bustling traffic creates a pocket of noise that is ever present in the area. The soot covered walls and rivers of sewage that run like a network throughout Dharavi constitute the bad image that this slum gets all over the world. But Dharavi is different. Within the outskirts of the slum lies a community. People have lived here for years and have almost built the entire community and area themselves. Over the years, a small but thriving market has formed. The district has an estimated 5000 business raking in a turnover (mostly illegal) of $500 million dollars. Dharavi exports goods all over the world, ranging from pottery to textiles. A large recycling industry that processes waste from other parts of the city has also found its niche in the busy area. People in this community strive for each other, suffer together and ensure everyone is living comfortably. Even the box-sized houses may look dirty from the outside, but on the inside one might be surprised to see marble floors and an overall sense of cleanliness inside the homes. Redevelopment plans have come and gone for Dharavi, with bids from big name companies like Lehman Brothers. The latest plans to redevelop the region are estimated at $3 billion dollars. The plans involve building schools, parks, roads and housing to serve the existing families. Nevertheless, opposition to these plans has arisen from residents claiming that their business would be relocated and only families who lived here pre-2000 are slated for resettlement. For a community that has continuously grown a strategy for redevelopment must take all current residents into consideration. Whatever the outcome, Dharavi will always be looked at either as an embarrassment to Mumbai’s financial power or another gem to Mumbai’s diverse culture. 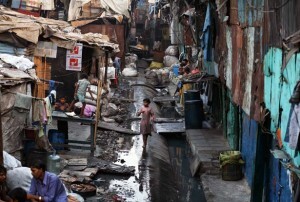 Danny Boyle depicted the beauty and sorrow of this slum in his Oscar-winning film “Slumdog Millionaire”, but even he would never be able to portray the impact this slum has both on the people who live within its wall and outside of them. Udit Hinduja is a graduate of New York University and double majored in Economics and Political Science. His focus areas were education, poverty and economic development in Asia and South America.